Naturally Toned Silver Copper and Nickel Coins. Toned coins are the result of a chemical process that reacts with the surface metal of a coin. Although any coin can tone, silver and copper coins are most susceptible to the toning process. United States Gold coins, on the other hand, are the least susceptible. However, these gold coins can still take on subtle shades of toning as they get older. This toning process is due to the fact that United States gold coins are composed of 10% copper. It is the small amount of copper that can oxidize and result in the toning of the coin. Toning occurs naturally over time. It is mostly the result of oxygen and/or sulfur reacting with the coin's metal. The toning process can be accelerated by heat, moisture and a variety of chemicals in the environment. Some of the most harmful chemicals to coins can be found in cheap coin holders and coin folders. Silver coins tend to tone in the most vivid colors. Colors can range in a variety of hues from brilliant blue to deep magenta, from vivid red to deep orange and a variety of shades of olive, green and gold. Additionally, toning can also turn ugly and occur in shades of black and brown. In the most severe cases, the toning can turn into corrosion and cause permanent damage to the surface of the coin. In the worst cases, corrosion can render the surface of the coin porous such that it looks like it was sandblasted. Naturally toned coins are the result of a long and slow process in which chemicals in the environment affect the surface of the coin. 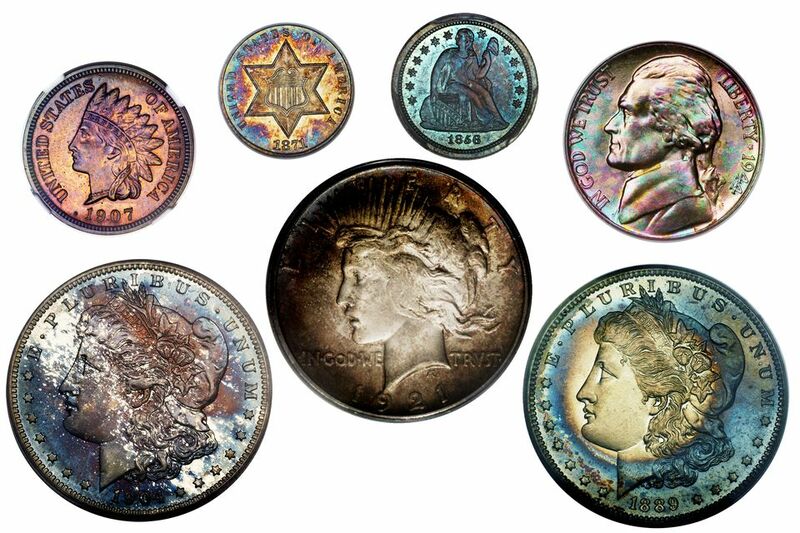 Morgan dollars are one of the most popular series of United States coins to collect with vivid toned colors. Naturally toned coins can bring a premium several times more than an untoned coin. Many of these silver coins toned as a result of the way they were stored for a long period of time. Some Morgan dollars sat for over 100 years in canvas bags in the United States Treasury's vaults. The chemicals in the cotton that was used to make the canvas bags reacted slowly over time and resulted in some beautifully rainbow toned silver dollars. Additionally, certain coin folders, coin albums and paper envelopes that are not made out of archival quality material can contain sulfur and acids that will react with a coin's surface. This can result in some beautiful rainbow toning or ugly brown and black toning. There are some unscrupulous "coin doctors" that will use a variety of chemicals and treatments to artificially create beautiful rainbow toning on coins. A professional coin dealer or third party grading company can detect this immediately. Additionally, the coin doctors may want to use toning to cover up imperfections or alterations on the coin. Toned coins have two opposing perspectives. Some coin collectors marvel at the beautiful colors that a vividly toned coin can possess. They will pay a premium over, above and beyond the value of an un-toned properly graded coin. Other coin collectors believe that the chemical process that has toned the coin is actually surface damage and avoid them altogether. Other numismatists argue that a silver coin that is over 100 years old cannot have brilliant white surfaces. Regardless of your perspective on toned coins, ugly black, brown or deep olive green toning that is mottled or uneven will negatively impact the eye appeal that a coin possesses and negatively impact its value. The coin market for toned coins is hot. The more vivid the colors and the more variety of different hues on a coin will increase its value. This can make a seemingly common low-value coin a rare collectible. A rare or scarce coin that has beautiful toning on it can reach astronomical values when sold. Since beauty is in the eye of the beholder, it is very difficult to predict with certainty the effect toning will have on the final value of a coin. Given these dramatic price fluctuations of toned coins, it is recommended that any toned coin that you purchase for a significant amount of money be certified by a third party grading service to ensure that the toning is natural and authentic. Avoid buying raw uncertified toned coins from online auction services.